P.V. Supa is a global provider of RFID, EM/RFID hybrid and barcode-based library solutions, and develops products solely for the library market. Our Automated Materials Handling system is fully modular, provides for fast installations and minimal downtime, is completely reconfigurable, expandable, and maximizes your material flow. P.V. Supa offers solutions for materials handling, return and sorting, that are designed to fit your specific budget and space requirements. We offer solutions that will fit small libraries and workroom spaces to systems that service very large and complex central sorting operations. Every library is unique with specific requirements; our library trained staff and engineers will work with you to design and install the system to fit your specific needs and requirements. P.V. Supa’s Self Service options, working in conjunction with the library’s ILS, combine efficiency, functionality, and attractive design to provide seamless, responsive service to library patrons. From patron counters to Self Service kiosks, P.V. Supa provides an array of accessories and services to meet your library’s need. Our self-service kiosks offer a variety of options from full size, height adjustable kiosks to compact space-saving table-top units ideal for smaller spaces, all place emphasis on usability and ergonomics for patrons as well as maintainability and ease of service for the library staff. Our Innovative Library concepts provide tools for libraries to be more creative and improve community engagement. We want to be part of the creative and dynamic changes taking place in libraries today through our “Innovative Libraries” developments. P.V. Supa provides ready, innovative solutions for libraries including, space solutions, extending library hours, better management of the request processes, and tablet lending. Our Smartblock provides a mobile, flexible space that doesn’t require costly renovation or expensive wiring. This plug and play solution provides an affordable option for creating additional meeting or tutoring space in your library. The Extended Open Hours solution is a self-operated solution that makes it possible to extend the library’s normal open hours. It is a complement to the existing manned hours, in which library users can still receive the necessary help and guidance. Our Hublet tablet lending system has proven to be a wonderful tool for libraries in the new digital age and has made loaning tablets easy; it is now possible for library visitors to check out a tablet with their library card and PIN code. The attractive design makes your digital material visible in the library space. Our key values have formed our long-time strategy as a company: to provide our customers with all the tools and knowledge necessary to streamline library processes. We consider our customers to be our business partners in our product development; an environment where ideas, customizations, and special requests are always welcome. We welcome the opportunity to work with you to create a custom-tailored solution for your unique situation. 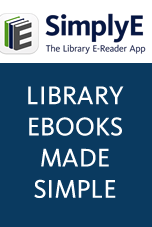 Get SimplyE for your Library! © 2019 Califa Group. All rights reserved.